I'm a huge fan of Justin Timberlake. He's an amazing singer, dancer and actor. 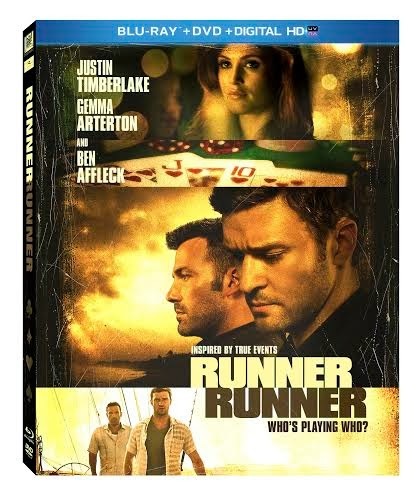 I haven't seen Runner Runner yet, but I am looking forward to it for the eye candy and my hubby will be interested in the movie because it talks about the world of Poker. I'm guessing this will be filled with lots of action as Richie Furst travels on an adventure trying to get his money back from an online poker site. Justin Timberlake and Ben Affleck star in this high-stakes crime thriller where the lure of easy money is the riskiest bet of all. When Princeton grad student Richie Furst (Timberlake) believes he’s been swindled by an online poker site, he heads to Costa Rica to confront gambling tycoon Ivan Block (Affleck), the man he thinks is responsible. But Richie will soon face the ultimate power play as he finds himself caught between Block’s promises of unlimited wealth and the zealous FBI agent (Anthony Mackie) trying to bring him down. The Blu-ray Combo Pack includes a bonus feature that reveals the true story behind the world of online poker, as well as never before seen bonus content. Do you play online poker? To enter this giveaway all of the sites listed below are real names of online poker websites except one, which one isn't?